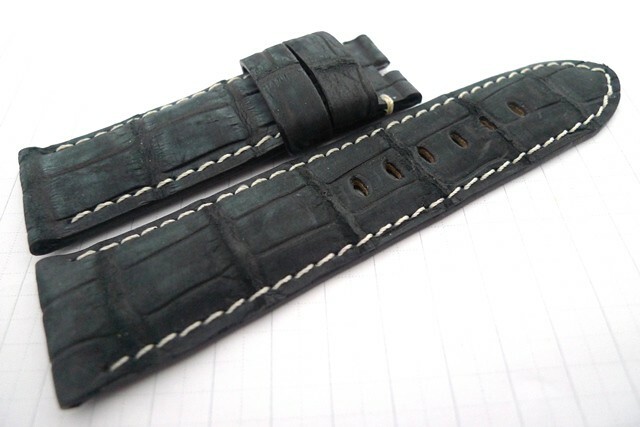 Handmade Genuine Grade A Louisiana Alligator Skin Straps. Individually, farm raised US Alligators. French Leather Lining. Excellent Craftsmanship. 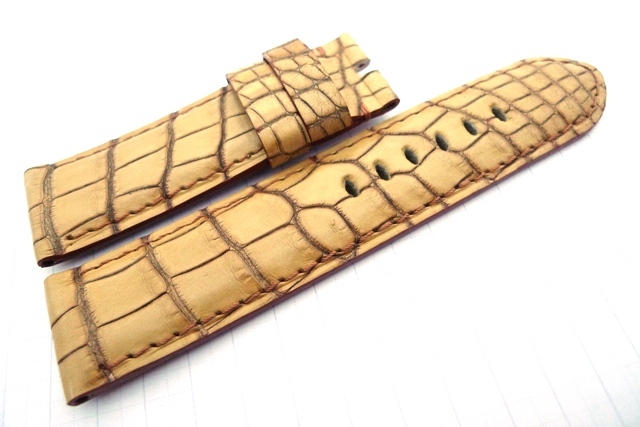 The pattern between the long and short straps matches. Craftsman trained by a renown French leather goods maker. 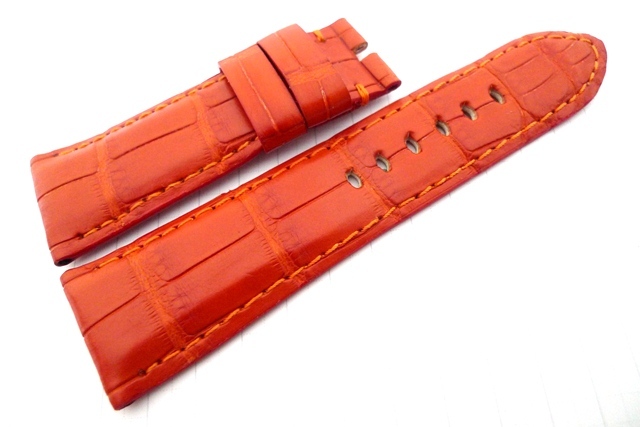 The Combination of Top Grade Leather and Superior Craftsmanship create Supple, Comfortable and Lasting Straps that molds to your wrist. 1. Ivory White. 22/20mm. Length: 110/70mm. Perfect Patterns. Price: USD159 Paypal and Delivered. 2. Glossy Azure Blue. Width: 22/20mm. Length: 110/70mm. Perfect Patterns. Price: USD169 Paypal and Delivered. 3. Ivory White. 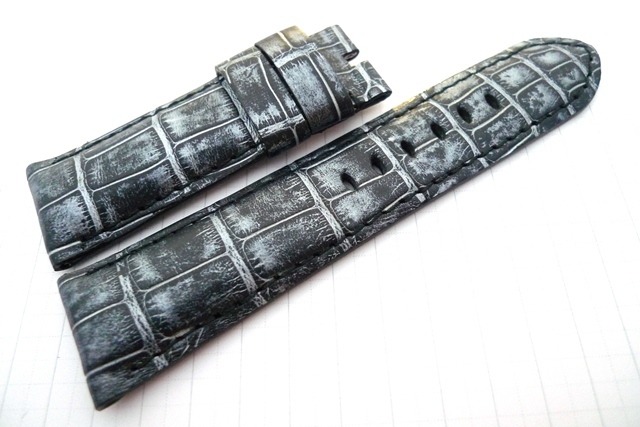 Width: 24/22mm. Length: 115/75mm. Perfect Patterns. Price: USD169 Paypal and Delivered. 4. Maroon. Width: 24/22mm. Length: 115/75mm. Perfect Patterns. Price: USD179 Paypal and Delivered. 5. Antique Black with Ivory Stitches. Length: 115/75mm. Perfect Patterns. Price: USD179 Paypal and Delivered. Also available in same colored stitches. 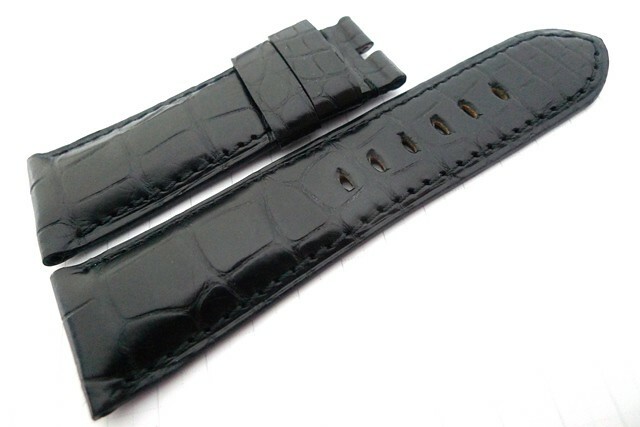 6.Black LVMH Louisiana Alligator with Ivory Stitches. Width: 24/22mm. Length: 120/75mm. Perfect Patterns. Price: USD189 Paypal and Delivered. 7. Dark Honey/Burgundy. 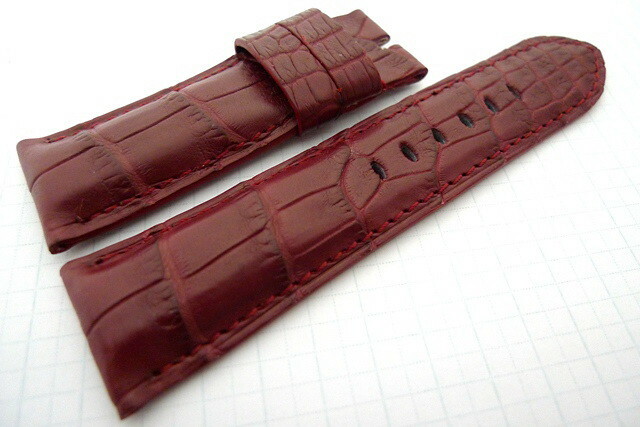 Width: 24/22mm. Length: 120/75mm. Perfect Patterns. Price: USD189 Paypal and Delivered. 8. Aged Gold LVMH Alligator Strap. 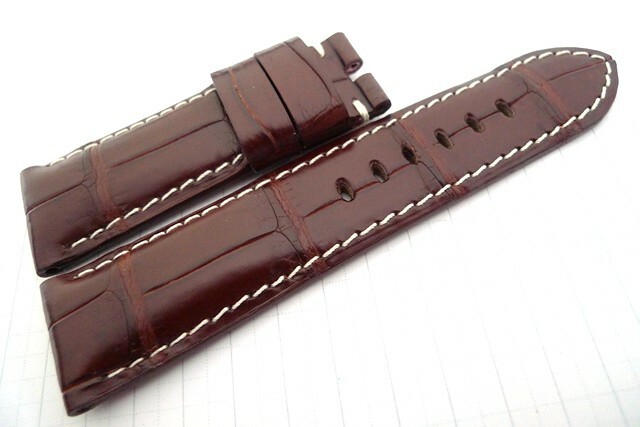 Width: 24/22mm. Length: 120/75mm. Perfect Patterns. 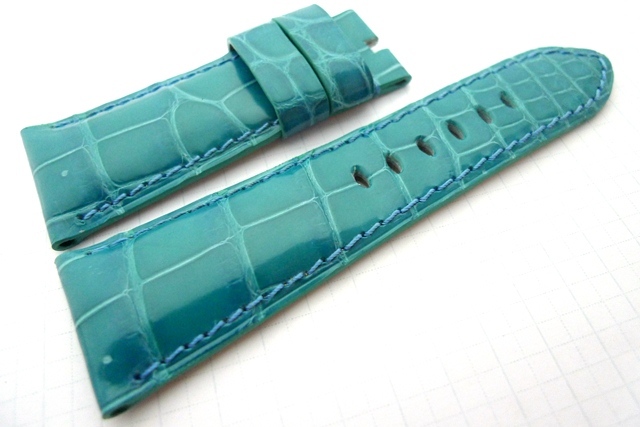 The skin was meticulously hand-finished by the LVMH Master Tanner to create the Patina effect. Price: USD209 Paypal and Delivered. Sold & Now Taking Orders. 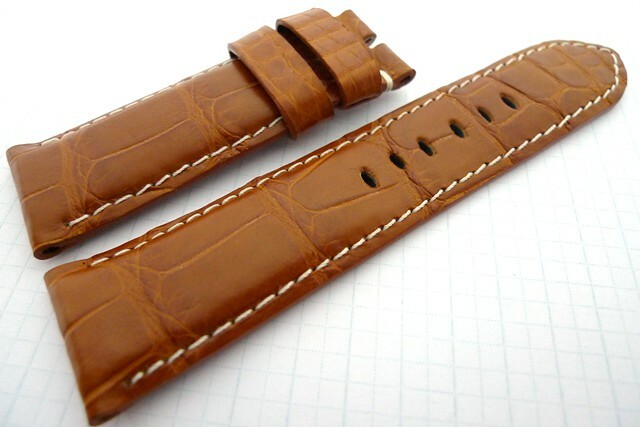 9.Chocolate Brown LVMH Alligator Strap with Ivory Stitches. Width: 24/22mm. Length: 120/75mm. Perfect Patterns. Price: USD189 Paypal and Delivered. 10. Siren Red. 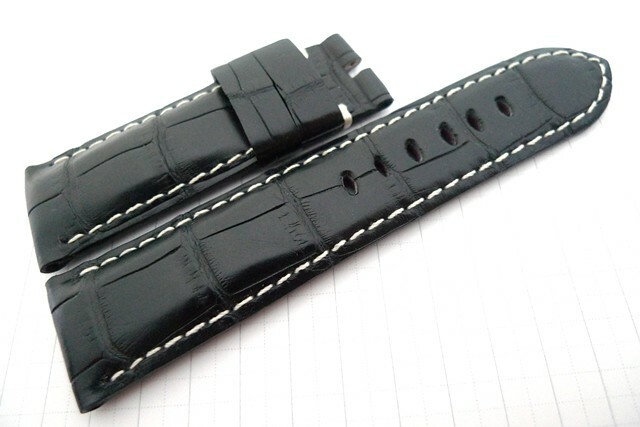 Width: 24/22mm. Length: 115/75mm. Perfect Patterns. Price: USD179 Paypal and Delivered. 11. Glossy Azure Blue with Ivory Stitches. 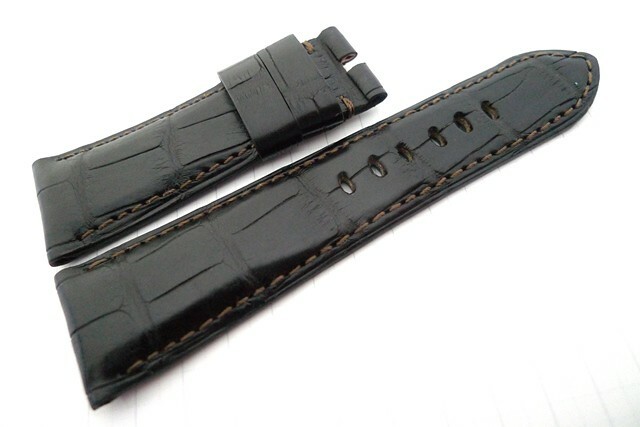 Width: 24/22mm. Length: 115/75mm. Perfect Patterns. Price: USD169 Paypal & Delivered. 12. Glossy Canary Yellow. Width: 24/22mm. Length: 115/75mm. Perfect Patterns. Price: USD169 Paypal and Delivered. 13. Glossy Shocking Pink. Width: 24/22mm. Length: 115/75mm. Perfect Patterns. Price: USD179 Paypal and Delivered. 14. Metallic Silver Black LVMH Louisiana Alligator. Width: 24/22mm. Length: 120/75mm. Perfect Patterns. The skin was meticulously hand-finished by the LVMH Master Tanner to create the Patina effect. Price: USD229 Paypal & Delivered. 15. Military Drab Green. 24/24mm Length: 130/80mm. Perfect Patterns. Price: USD179 Paypal & Delivered. 16. LVMH Choco Brown, Matte Finish & Hi-Shine. 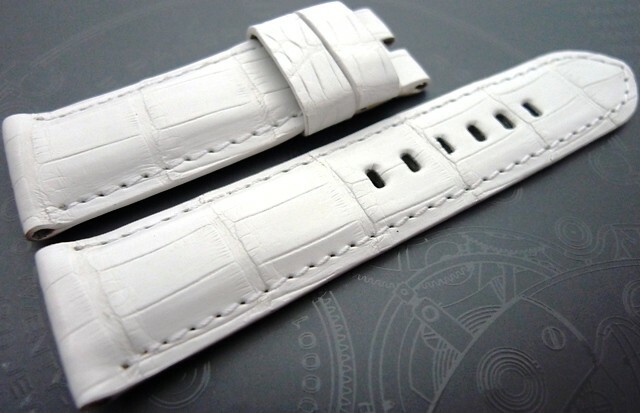 Width: 24/24mm. Length: 130/80mm. Perfect Patterns. Price: USD189 (Ex. 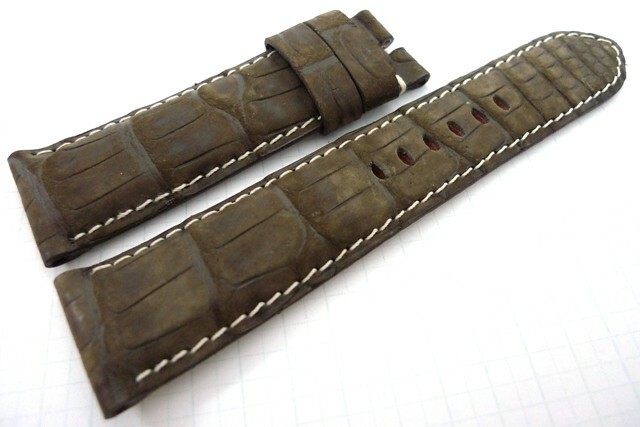 buckle), USD214 (Incl. 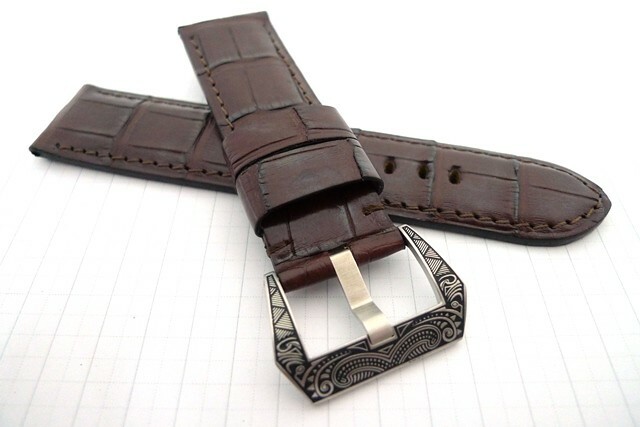 buckle) Paypal & Delivered. 18. Hermes Sanguine LVMH Louisiana Alligator. Width: 26/22mm. Length: 120/75mm. Perfect Patterns. Price: USD199 Paypal and Delivered. 19. 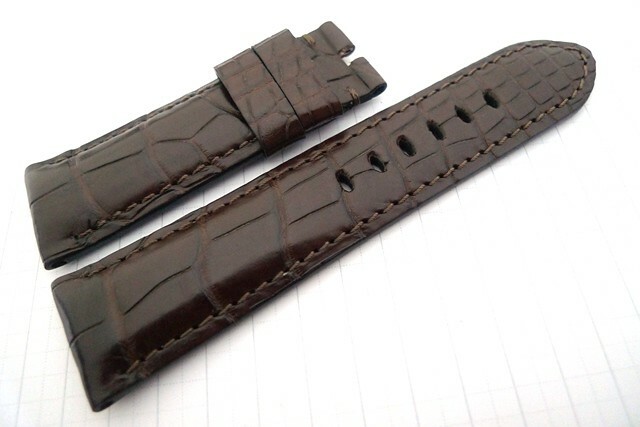 Dark Brown LVMH Louisiana Alligator. Width: 26/22mm. Length: 120/75mm. Perfect Alligator Patterns. Price: USD199 Paypal & Delivered. 20. Black Louisiana Alligator. Width: 26/22mm. Length: 115/75mm. Perfect Patterns. Price: USD189 Paypal & Delivered. Perfect for your 183, 210, 372, 422 & 424. 21. 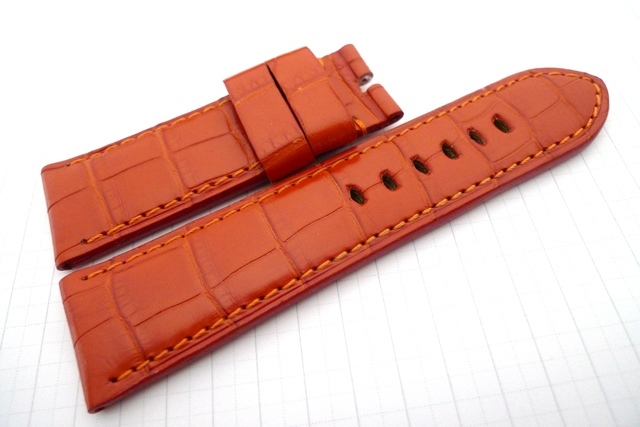 Hermes Sanguine LVMH Louisiana Alligator. 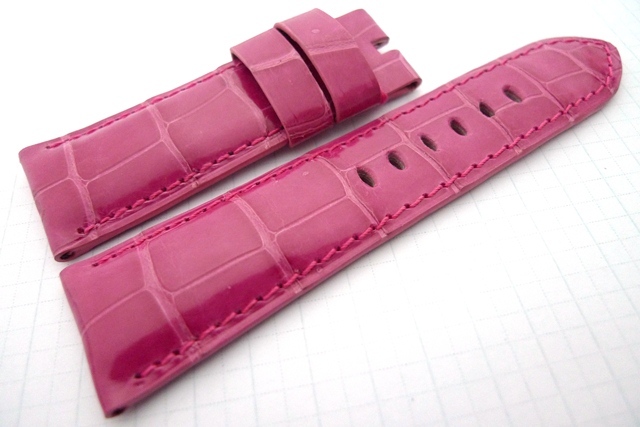 Width: 26/24mm. Length: 130/80mm. Perfect Patterns. Price: USD209 Paypal & Delivered. 22. 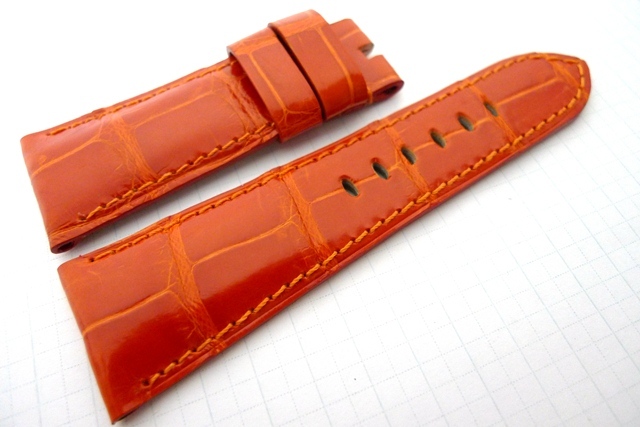 Glossy Hermes Orange. Width: 27/22mm. Length: 115/75mm. Perfect Patterns. Price: USD179 Paypal and Delivered. SOLD. 23. Glossy Azure Blue. Width: 27/22mm. Length: 115/75mm. Perfect Patterns. Price: USD179 Paypal and Delivered. 24. Godiva Brown Nubuck with Ivory Stitches. Width: 26/24mm. Length: 140/90mm. Perfect Patterns. Price: USD199 Paypal & Delivered. 25. LVMH Choco Brown, Matte Finish & Hi-Shine. 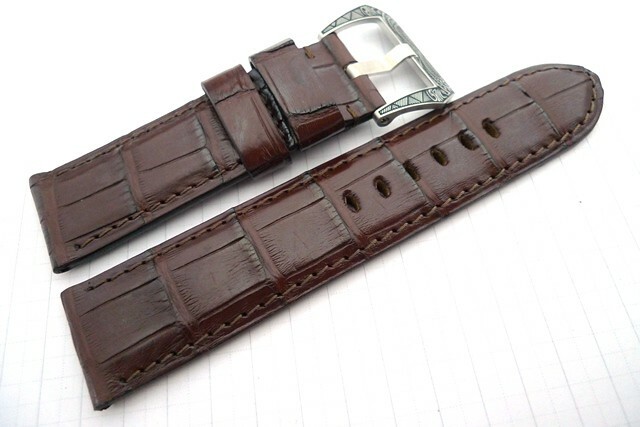 Width: 26/26mm. Length: 130/80mm. Perfect Patterns. Price: USD189 Paypal & Delivered. 26. Honey Tan with Ivory Stitching. Width: 27/22mm. Length: 130/80mm. Perfect Alligator Patterns and Perfect Darkening of the Scale Edges. 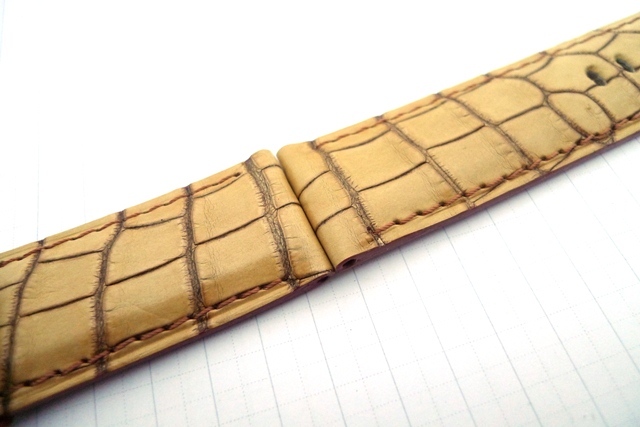 Folded Edges. For Deployant Buckle. Price: USD199 Paypal & Delivered. 27. 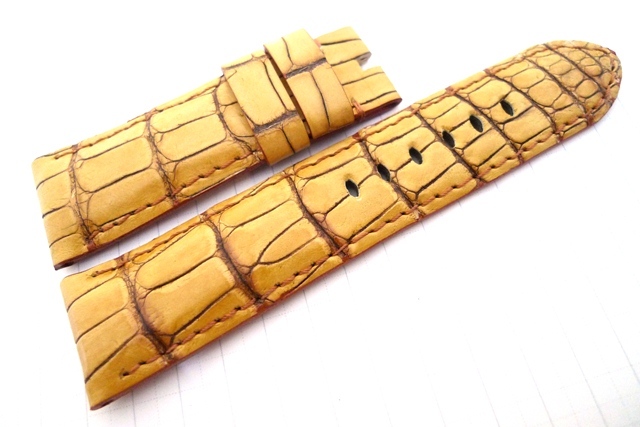 Honey Tan with Ivory Stitching. 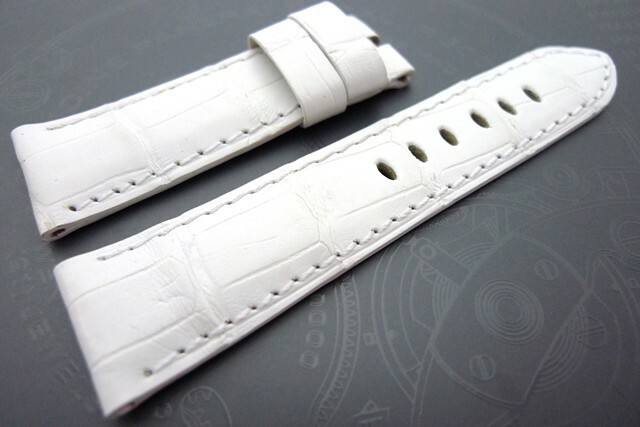 Width: 27/24mm. Length: 130/80mm. Perfect Alligator Patterns. Price: USD189 Paypal & Delivered. 28. 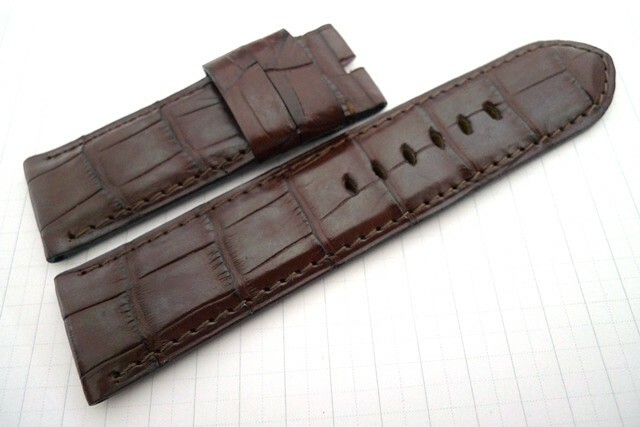 Panerai Style 316L Stainless Steel Buckles. Brushed Finished. Price: USD25. 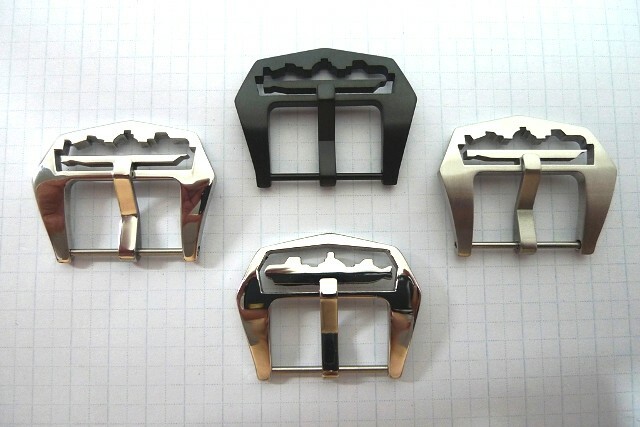 Polished Finish Buckle. Price: USD25. Polished Thumbnail. Price: USD25. PVD Finish. Price: USD33. 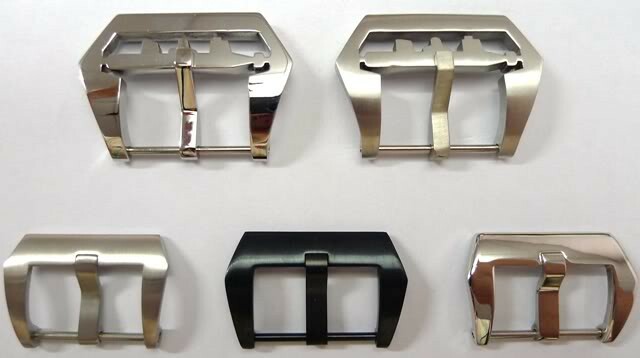 24mm Brushed & Polished Finish Pig Buckles. Price: USD35. 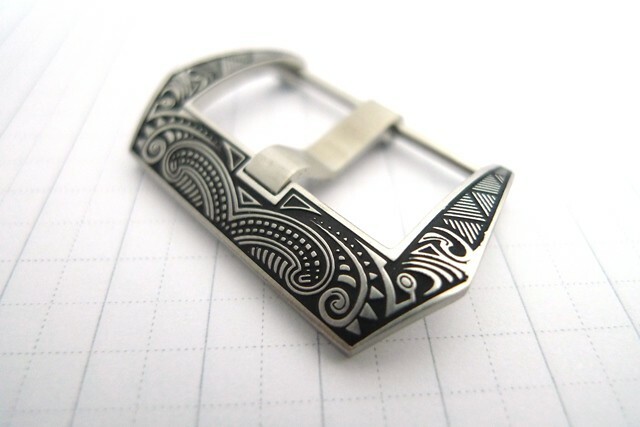 24mm Engraved Native Tattoo Pre-V Buckle. Price: USD35. 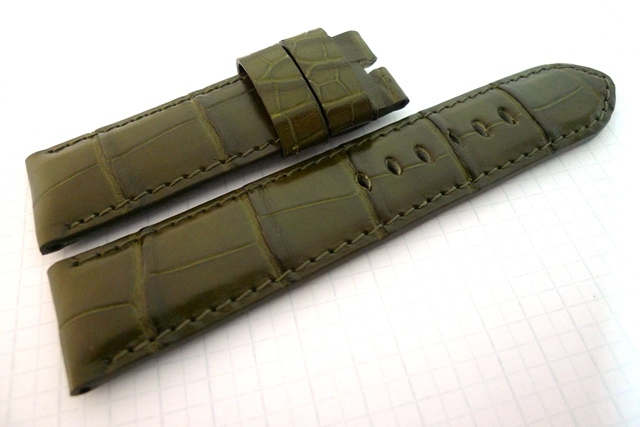 PVD Pig & Torpedo Buckles. Price: USD40. Pls email for stocks, custom orders, enquiries or references.